The change of seasons has me thinking integrated marketing strategies and how we can clearly communicate our thinking to clients and others. Recently the SEO team here at Mid-West Digital Marketing has been asked about “aggressive” SEO, or how can we “accelerate” our service for clients. The thought is that if a client needs help boosting their business quickly, an aggressive approach to their organic search will get visitors flocking to their website. Unfortunately, this isn’t the case. While I contemplated a way to perform an aggressive form of SEO, I had a revelation. I’m talking about a late night, pop you out of bed, groundbreaking revelation. Aggressive SEO is an oxymoron! SEO by nature is very static. Changes that are made on a website for SEO purposes usually take time to marinate with the Search Engines before you see a boost in traffic. That revelation led me to another revelation! Paid Search is where we can be aggressive for our clients! I love to use analogies to help describe some of my thoughts (remember my TBT post?). 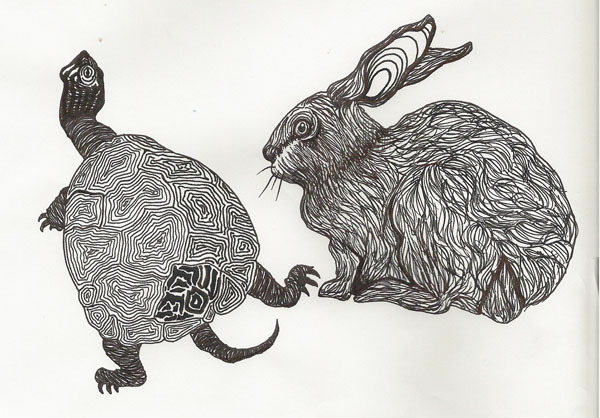 So when one of my associates mentioned that SEO and PPC are very similar to the story of the tortoise and the hare, I was excited. This was a way I could explain the nature of SEO and PPC. SEO is the tortoise; methodical, slowly moving forward with its eye on the goal. PPC is the hare; able to agilely respond based on consumer behavior while moving forward with its eye on the goal. There is, however, one big difference: in the story of SEO and PPC, there is no loser! This all brings me back to a recurring theme you’ll notice in a lot of my blogs; Integrated Marketing. By having well thought-out SEO and PPC strategies in place, you will be able to cast the widest net possible where Search is involved. Filed under: Digital Marketing, SEO.